Distance to Discount Ratio? How About a Work to Incentive Ratio? Today, TechCrunch called out some numbers from the folks over at JiWire that quantify how far people are willing to travel to get higher levels of discounts. Wait – people will travel further for bigger discounts? No way! Kidding aside… first, this overly simplified take on the data makes me think a lot of people way undervalue their time. 40 percent of respondents will travel up to an hour for a 40% discount on a $100 item? People – haven’t you heard of Woot? Second, while the implications of this are pretty obvious for location-based promotions, I’d love to see some data that tells the story of how much “work” people will do in exchange for incentives online. How many friends’ email addresses will Joe sell out share in exchange for more vegetables for their virtual farm? How many completely irrelevant offers will Franklin click on to build up points for a gift card? How many times will Susie refresh a page to get a free sample worth less than a buck? What are the incentives required to get engaged users of your product to enthusiastically tell their friends? I ran a promo in late 2010 where a beauty product that’s normally $89 was offered on an extremely high profile national TV show for just $10. The resulting traffic to the website was roughly 500 times average. The site slowed to a crawl, and would-be customers had difficulty purchasing. One of the most amazing things about this offer was the number of people who complained angrily via Facebook and the more traditional customer service channels that they’d been “refreshing for ten hours” to make the purchase. Important feedback, and very helpful in understanding the level of emotional investment in the product, but the time investment people were willing to give up was way higher than I’d have suspected. The vocal folks in this case were a small minority compared to the overall sales, and I think it’s important to not place too much value on the anecdotal information. Still, ten hours of refreshing to save $79 on a non-essential cosmetic product? Apple(weak)sauce – It Just Works. NOT. Maybe it’s just daylight savings time that has me a bit grumpy this morning. I prefer to wake up when it’s still dark, or at least gray. Or maybe I’m grumpy because my iPhone – an allegedly smart phone – failed me this morning. I knew, or at least suspected, that it was going to happen. Both Angelica and I have iPhones, and reset our alarms last night, but just in case, I set the regular old alarm clock too. This morning, I was awakened by the beeping of that dinosaur, not either of our iPhones. Apple has been aware of the issue for at least a month, and even created a support article about it. But in typical Apple fashion, they were pretty quiet about it. In fact, if I hadn’t heard about it from Angelica, I wouldn’t have known about it at all. I’m a busy guy – I don’t pay attention to all the iPhone/Apple chatter. I shouldn’t have to – this thing is supposed to just work, right? Judging by the noise on Twitter this morning, I’m not the only one who didn’t notice until too late. Just to make sure I hadn’t missed anything, I connected my iPhone to my MacBook Pro and fired up iTunes. Nope – no software update, no warning, no messaging at all. I did have to agree to YET ANOTHER iTunes Store Terms and Conditions update – maybe there’s a new clause that explains that the alarm clock doesn’t actually work. This is a missed opportunity. Apple should have sent an email campaign with the workaround instructions, rather than relying on the blogosphere and the media, maybe even done some PPC marketing on keyword phrases like “iPhone alarm clock fix” with the support article as the landing page. Hell, even AT&T could have done it, by email or text message. It’s not like they don’t need every bit of goodwill they can get from iPhone users. Instead, we get a support article that doesn’t even make the iPhone Hot News page. Instead, we get people waking up late for work. Instead, we get people pissed off at Apple and maybe looking at one of those slick new Android phones instead of following the default next-gen iPhone upgrade path. Listen up Apple. I love your products. I’ve sent a lot of cash your way. But dumb errors like this (and even dumber handling of them) makes me want to drink someone else’s Koolaid. 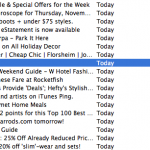 Subject Line Experimentation: Special Characters – Genius or Garbage? Macworld getting a little crazy with the subject line. 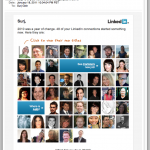 I subscribe to a LOT of email – I like to see what other email marketers are doing. Because of this, I get so much email that I’m in constant email overload mode (sounds familiar, I bet) and it takes something pretty spectacular – or really lame – to get my attention. Taking a peek at my subscriptions inbox this morning, I saw an email from Macworld with a three character subject line: –>. That’s not me pointing at something, that’s the subject line. An arrow. Ever the jaded online marketer, my first thought as I glanced through my emails was “Oops, someone screwed up personalization again.” Then I thought maybe some really crappy spam had snuck into my inbox somehow, until I saw the from: Macworld Gems. I think overly gimmicky subject lines can be a bit of a risk, and tricks like this are usually one-shot deals. But, as we always say, “test, test, and test s’more!” So what were the email marketers at Macworld thinking on this one? Maybe in a vertical preview pane, the “look over here” arrow mechanism works. Maybe they just thought it’d be eye-catching. For me, it just looked weird, like a mistake. But… I noticed it. 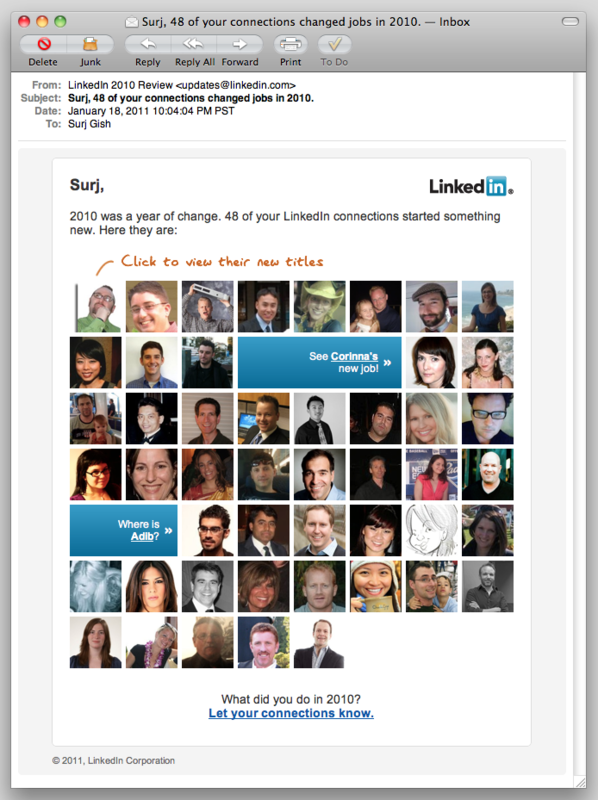 What would a “normal person” (non-email marketer) think of this?